The National Youth Council of Ireland (NYCI) – which represents organisations working with over 380,000 young people nationwide – is calling on young people aged 18 to 25 from around Ireland to apply to become Ireland’s UN Youth Delegate for 2018/2019. Ireland’s current UN Youth Delegates Lauren Flanagan and Paul Dockery meet Minister of Foreign Affairs and Trade Simon Coveney in Iveagh House, Dublin. 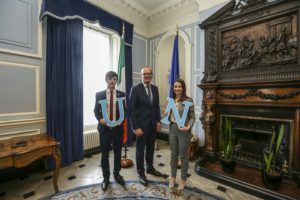 The United Nations Youth Delegate Programme, coordinated in Ireland by the National Youth Council of Ireland (NYCI) with the support of the Department of Foreign Affairs and Trade, will see two young people join Ireland’s delegation to the United Nations in New York in September and October 2018 and February 2019. Valerie Duffy of the NYCI explained: “We are looking for applicants from all around the country, so I would encourage any young people aged 18 to 25 to apply for this amazing opportunity to represent Ireland at the highest international level, and to work on important issues including immigration and the new Sustainable Development Goals. Young people in Ireland have a vital role to play in shaping the Sustainable Development Goals, and they are part of the first generation that can end extreme poverty and fix climate change.